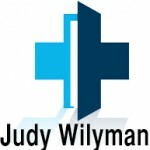 I invite all doctors to contact me with their comments about the information on this website. Please provide the evidence for your comments for debate. Only letters that are for respectful debate will be published on this website. Here also is a link to the NVIC 4th International Conference on Vaccinations in Reston, Virginia in 2009. It was titled “Show us the Science; give us the choice” and many doctors spoke at this conference stating that vaccines are not safe and effective and vaccine reactions are not rare. Here is a video titled “54% of children suffer disabilities caused by vaccination” (in Australia this was 41% in 2004), made in 2015 describing the escalating chronic illness that has occurred in children in highly vaccinated communities since the vaccine schedule was expanded in the 1990’s. These diseases were already a low risk to the majority of the population in the 1990’s yet they were implemented with financial inducements for doctors and parents and with claims that they are necessary to create “herd immunity” for the protection of the population. This claim is not supported with evidence yet parents are made to feel irresponsible if they do not vaccinate. This video shows many doctors, nurses and immunologists who are stating that vaccines are not safe or proven effective against the diseases they claim to prevent. Here is another video in which Dr. Stephanie Seneff describes the potential mechanism by which vaccines could be causing autism in children. Here is a Criminal Prosecutor describing the evidence for the link between vaccines and autism. Consumers also need to be informed about the regulations for doctors, nurses and midwives that require them to support and promote government vaccination policies. This is enforced by the health practitioners regulations that is linked to a practitioner’s certification. This law states that practitioner’s are not to provide patients with literature describing the risks of vaccines that is not presented in their medical education – an education that is largely funded by the pharmaceutical companies. This funding allows pharmaceutical companies to have influence over the studies that are selected to educate health practitioners and this selective education is enhanced by the fact that most safety and efficacy trials for vaccines are funded by pharmaceutical companies. There is no independent assessment of the medical literature on vaccines that is provided to health professionals or for government vaccination policies. The National Scheme for health practitioners recognises the Australian National Immunisation Handbook (AIH 10th Ed) as providing the basis for vaccination policies and any risks that are not described in this latest edition are termed “anti-vaccination material” and health practitioners can be reported for presenting these documented risks for vaccination. Whilst the board describes the AIH (10th Ed) as being the “best available evidence ..” there is no transparency in the independence of this evidence in the 10th Ed handbook and it is known that the pharmaceutical companies have many conflicts of interest in the production of vaccination science and policy. An example of the lack of objectivity in the Australian Immunisation Handbook (10th Ed) is the lack of coverage of the many studies that demonstrate vaccines are a causal link for autism. Here is the trailer for the Vaxxed Movie that shows how research at the US CDC was manipulated by researchers to remove the data showing a link between the MMR vaccine and autism. The title is “Vaxxed: from Cover-up to Catastrophe”. In February/March 2014 John Cunningham took up my invitation to doctors to debate my research. 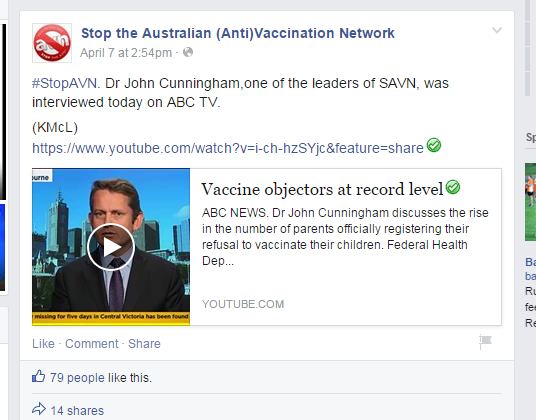 He is a leader of the Stop the Australian Vaccination Network (SAVN) – a lobby group run from an anonymoyus facebook page linked to the Australian Skeptics Inc, a non-scientific organisation – and a medical practitioner. When responding to my request he chose to send his opinons of my research, with false information, to members of the public, including UOW academics and journalists. This occurred whilst I was a student at the University of Wollongong (UOW) and the University of Wollongong’s policies allowed members of the public to reduce the credibility of university research in this way. The university academics were not required to correct the false information that John Cunningham provided to the public nor were they required to tell him it was not appropriate to copy their addresses into the copied (cc) field of the email – which can imply that it is endorsed by the UOW academics. Here are the corrections to the false and misleading information that John Cunningham provided to members of the public and UOW academics in his emails in 2014 that denigrated my research. John Cunningham does not have any public health qualifications so why did the University of Wollongong allow UOW academics to be visibly copied into these derogatory emails? And is it appropriate for a medical practitioner to denigrate a student’s research and reputation in this manner? John Cunningham is a leader of the SAVN lobby group that uses abuse, ridicule and false information to reduce the credibility of university research. Professor Brian Martin has written several articles on the abuse and harassment my research has received from the SAVN lobby group. In this article Brian Martin states “I have studied issues of intellectual freedom for many years; never have I heard of a campaign against a research student more relentless and abusive than the one against Judy.” Yet the leader of the Australian Greens, Richard Di Natale, supported these activists with false comments in his support for SAVN in his parliamentary speech. Further, in July 2014 John Cunningham made an anonymous complaint to the University of Wollongong about my whooping cough research project completed in 2006. This research project was a critique of the Australian government’s whooping cough policy and the research was awarded a high distinction by UOW academics in 2006. Yet in 2014, John Cunningham, a member of the public (not a member of the UOW community) and SAVN activist, was permitted to make an anonymous complaint of allegations of academic misconduct about this research. This was 8 years after the research was completed and the degree awarded. An investigation was implemented without any evidence of misconduct being provided. The UOW concluded that it was an unwarranted investigation. However before its conclusion in May 2015, the ABC provided anonymity to “two medical experts” in November 2014 who published information about the investigation using my name in the article. This harmed my reputation with an investigation initiated by John Cunningham without eny evidence for his allegations. This occurred even though the university’s investigation procedures were confidential and even though the investigation had not been completed. At the conclusion of the investigation (May 2015) I received an apology from Judy Raper, the UOW Vice-Chancellor of Research, for the unwarranted investigation and she stated that the university’s processes had been misused, “university complaint processes are not a forum for academic debate.” The unfounded allegations had been published in the mainstream Australian media despite the fact that the investigation had not been completed. Here is the research project ‘An Analysis of the Federal Government’s Pertussis (Whooping Cough) Policy‘ (unchanged) that received a high distinction from UOW academics in 2006 and that industry lobby groups smeared with false information in 2014. This conduct by John Cunningham, a medical practitioner, was reported to the Australian Health Practitioners Regulatory Authority (AHPRA) in March 2017 and I have not received a conclusion to this investigation. 1) Why did the University of Wollongong allow a member of the public to make an anonymous complaint of ‘allegations of academic misconduct’ about student research that was completed 8 years prior to the complaint and without providing any evidence to support the complaint? This was a complaint by a member of the public who was known to the UOW executive for previous inappropriate behaviour in debating my research. The NSW Ombudsman replied on the 12 December 2017 without addressing this complaint and stating that the review is closed and no further correspondence will be acknowledged or provided with a response unless it raises substantive new issues that warrant an action. Here is the reponse I provided to the NSW Ombudsman on 14 December 2017. It is well recognised that when individuals cannot address the evidence in a scientific argument they attack and disparage the messenger. This has been observed in the opinions presented by both John Cunningham and Kristin Boyle – both medical practitioners – as well as many journalists who have presented their opinions without addressing any of the arguments in my in-depth and detailed PhD thesis. The public should be asking why these supporters of pro-vaccine lobby groups, including many medical practitioners, are accepting the claims of the vaccine industry (most of the research is funded by the vaccine industry) without any independent scrutiny of the academic literature? Kristin Boyle, the medical registrar at Geelong Hospital Emergency Department, admits that she only attempted to read my 390 page thesis for “..the better part of two days…” before posting her comments on her blog. After this brief examination she concludes it is “…irrelevant, deliberate or unintended misinformation..” and “a junk thesis”, without providing any supportive evidence and despite the University of Wollongong stating publicly that it “stands by this thesis” because the assessment process was rigorously followed. She simply states that the evidence for her opinons is provided by Dr. Helen Petousis-Harris. But Helen Petousis-Harris also makes her arguments by attacking the messenger and using her own interpretations of my research to influence the reader with disparaging comments. She even attempts to discuss the global postlicensure safety surveillance data for the HPV vaccine that I was discussing from 2009, by using an article written in 2015. The discussion I was presenting was about the conclusions being drawn by researchers in 2009 so her use of the data from 2015 is a deliberate or unintended misunderstanding of the arguments being presented. Both Helen Petousis-Harris and Kristin Boyle are presenting their opinions of a PhD thesis on blogs that are not published in peer-reviewed journals or on university websites. Why are these individuals, and pro-vaccine lobby groups and journalists, allowed to promote their arguments using personal opinions? The Australian journalists who have stated they will not present the published academic literature that I am presenting that describes the lack of safety and efficacy of many vaccines include Jane Hansen (News Ltd), Janet Albrechtsen (News Ltd), Caroline Marcus (News Ltd), Sarrah Le Maurquand, (News Ltd), Jonathon Holmes (ABC) and Virginia Trioli (ABC, who made false claims that the link between vaccines and autism has been “debunked” and “..expunged from the medical literature.”). Other journalists such as Rick Morton (News Ltd), Kylar Loussikian (News Ltd) and Emily Laurence (ABC) have written biased stories without interviewing me and these stories based on their personal opinions are then quoted on the blogs of lobby group activists and vice versa: journalists and individuals such as Kristin Boyle are quoting comments taken from pro-vaccine lobby group blogs such as FSM and SAVN. The lobby groups and many medical practitioners are coming from the a priori position that is being stated by vaccine manufacturers and the Australian government. This position is that “all vaccines are safe and effective” and they are not addressing the overwhelming academic literature, some of which is presented in my detailed PhD thesis, that demonstrates many vaccines are not safe and effective. For example the HPV vaccine. Why are pro-vaccine lobby groups not allowing proper scrutiny of the science? Kristin Boyle, like John Cunningham, incorrectly states that my PhD was not assessed by experts in the scientific fields of immunology and epidemiology. This is false. My thesis was scrutinised by experts in these fields before it was submitted to the examiners in the UOW School of Humanities. My thesis covers the politics and science of the governments vaccination policy and John Cunningham, Kristin Boyle and Helen Pertousis-Harris, are misinforming the public with unsubstantiated comments. The factual basis of the literature I have presented in my PhD thesis has not been addressed by these individuals or journalists in their opinion pieces. I have demonstrated my willingness to attend a public debate on vaccination by agreeing to be on a panel for a public forum discussing the Australian government’s ‘No Jab No Pay/Play’ policy in October 2015 – before this legislation was passed. Yet Peter McIntyre and Robert Booy plus 45 other government representatives and public health authorities would not attend this forum to debate this science at the University of Technology, Sydney (UTS). Why not? Further, Kristin Boyle states that the director of the National Centre for Immunisation Research and Surveillance (NCIRS) for Vaccine Preventable Diseases, Peter McIntyre, describes me as “‘not willing to entertain evidence’ which contradicted her beliefs.” This statement is false and unsubstantiated. Peter McIntyre is not demonstrating his willingness to entertain evidence that contradicts his beliefs by declining to debate vaccination in a public forum organised at a university and he has not given his consent for his recently digitised PhD (June 2016) on the Childhood Haemophilus Influenza B vaccine (HiB) to be made publicly and freely accessible for debate on the NCIRS website or the University of Sydney website? Why not? Whilst Kristin Boyle credits the Haemophilus Influenza B vaccine (HiB) with the unintended side-effect of reducing the cases of bacterial epiglottis in children, she does not question why medical practitioners in 2016 are seeing an escalating increase in autism and chronic illness in children, including significant neurological damage and autoimmune diseases, that make parents life-time carers for their children. Why is Kristin Boyle not prepared to question or scrutinise in-depth all the causes of this new chronic illness? Instead health practitioners of 2016 are happy to suggest that this is the “new normal” and “just a coincidence” when it occurs after vaccination. And in the same breath they will claim they are supporting “evidence-based medicine“. Yet the correlations of these illnesses with vaccines are not being investigated to prove or disprove a causal link. It is time for the belief system of medical practitioners in 2016 to be questioned and properly debated with academic literature as opposed to the personal opinions of individuals and lobby group supporters promoting the use of more and more vaccines. Whose interests are these pro-vaccine lobby groups promoting when they do not question or investigate the serious illnesses in children today, and they disparage with personal opinions the in-depth academic research assessed and defended by academics at an Australian university? Why is the Australian government aggressively marketing HPV vaccines at $Au450 per person when the vaccine has not been proven to be safer or more effective than Pap screening combined with surgery – and Pap screening will still be needed by vaccinated women? The vaccine does not target at least 30% of cervical cancer (13+ high-risk HPV strains are not covered in the HPV vaccine) therefore it is not more effective than Pap screening which detects 9 out of 10 cancers and these are curable when detected early (WHO). As of April 2014 the Japanese government has suspended the recommendation of HPV vaccines until further safety studies have been done. Here is a link to the suspension of HPV vaccination programs in Japan due to serious adverse events and death. Here is a link to the scientific evidence linking vaccines as a cause of autism. This includes the video titled ‘Vaccines cause more autism than the CDC will admit.’ (18 mins). Here is a letter to the editor of the South Asian Journal of Cancer by Sudeep Gupta (vol 3 Iss 1, Jan-Mar 2014) that summarises the concerns about HPV vaccines published in my article in the Infectious Agents and Cancer Journal (June 2013). Here are the published case reports that demonstrate the association between HPV vaccines and neurological damage in many women. Here is a link to an article that describes how all medical research is influenced at every stage by industry (European Journal of Clinical Investigation, Feb 2013) .